As the result of increasingly stringent discharge regulations and a growing level of environmental awareness, there has been an increasing demand for advanced wastewater treatment systems such as the Membrane Bioreactor (MBR). This technology is already being applied by Triqua on a large scale within the manufacturing, shipping and offshore industries. This technique has proven to be reliable and complies with the increasingly stringent discharge and safety regulations. The wastewater that is treated is collected from streams such as flush water from lavatories, shower and bath water, household rinse water and water from laundries. The latter also contains a substantial amount of oil from overalls. In Kazakhstan, authorities have issued stringent regulations with respect to the discharge of wastewater from a number of different floating hotels. This water must be completely colourless and odourless; its temperature may not be more than 2 °C higher than the surrounding sea water and it may contain barely any traces of nitrogen and phosphate. The primary reason for these strict regulations can be attributed to the fact that this area has been designated as a nature reserve. Another factor that cannot be overlooked concerns the protection of the sturgeon, which is of great economic importance to the region in light of the caviar-producing industry. In order to comply with these stringent discharge regulations, advanced and innovative treatment systems must be installed on or in the vicinity of the various floating hotels. In addition, the water that has been treated must be reused to the greatest possible extent, keeping zero discharge. Taking into account the location and the circumstances, these treatment systems must be operable under extreme weather conditions. In the Caspian Sea and the surrounding area, temperatures can rise up to +45 °C in summer, and drop down to -40 °C in winter. In addition, it takes a long time to deliver replacement materials, which is why the most sensitive elements are executed in duplicate. Taking these circumstances into account as well as the limited amount of space, very high demands will be placed on this water treatment system. Membrane reactor technology can be applied here successfully because this will allow microbiological treatment and membrane filtration to be integrated into one compact, reliable and simple system. The ultra-filtration membranes provide a constant high quality of effluent, thereby adhering more than sufficiently to the discharge regulations. It is recycled as flush water in lavatories, washing water in laundries and as residual water for drilling operations. To monitor offshore projects in the Caspian Sea, Triqua requires 24-hour surveillance of the water treatment process. 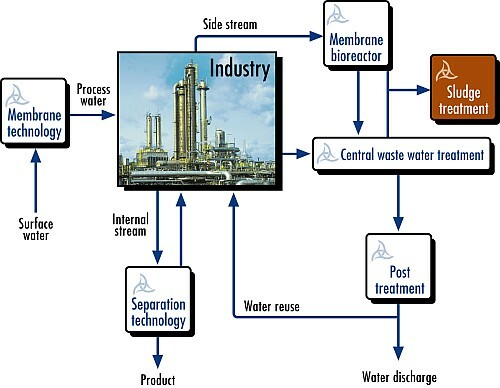 The process control and support is the core of the installed base management and comprises the following elements: provision of digitized user manuals and installation-specific data (knowledge management), an overview of all spare parts and ordering functions, collecting log data with respect to the installation and its processing in convenient graphs and diagrams, access to the Triqua support team and the mutual exchange of knowledge and information between the operators on the site. With these software and internet applications it will hardly make a difference whether the data being processed is from your own working environment or, let’s say, from the Caspian Sea. Triqua has supplied a great many complete wastewater treatment systems for various oil rigs and accommodation barges in the Caspian Sea. Several of these have been installed on oil rigs, others on barges with crew accommodations and dive support ships.